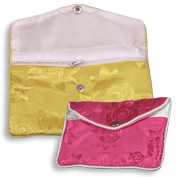 Discover our collection of Chinese silk zipper pouches! Help your customers transform the way they present their jewelry gifts with these stylish pieces for rings, earrings, pendants, necklaces chains & more. Items available in black, red, green, and even with fun dotted patterns. And thanks to our wholesale deals, you won't break the bank!